Each Barbie fashionistas doll has her own look and style -- from Camo ruffle to shimmery rainbow stripes, all of the fashions are inspired by the latest trends! collect them all to explore countless looks. The latest line of Barbie fashionistas dolls includes four body types, 10 skin tones, 12 eye colors, 12 hair colors, 12 hairstyles and so many on-trend fashions and accessories! with added diversity and more variety in styles, fashions, shoes and accessories, kids everywhere will have infinitely more ways to spark their imaginations and play out their stories. 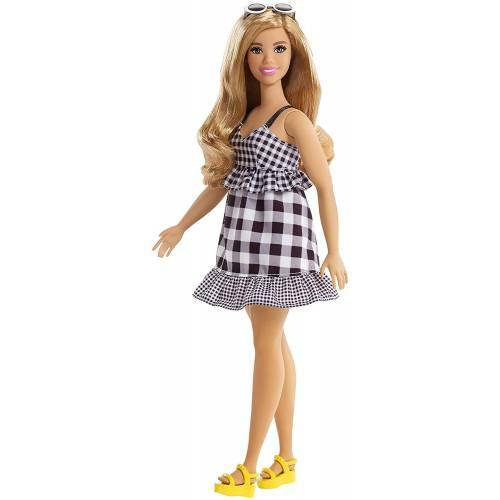 Includes Barbie fashionistas doll wearing fashions and accessories.